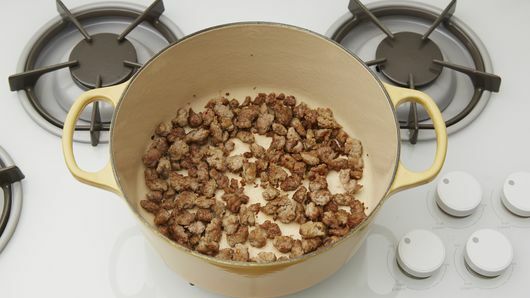 In 5-quart Dutch oven, cook sausage over medium-high heat 5 to 7 minutes or until no longer pink; drain. Add spaghetti, tomatoes, broth, cream and pepper flakes; heat to boiling. 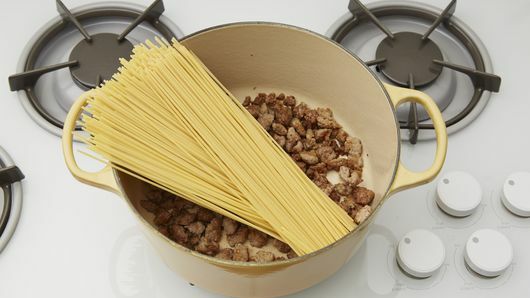 Reduce heat to medium, cook 15 to 20 minutes, stirring frequently until pasta is tender and sauce is thick and creamy. Serve with Parmesan cheese and fresh basil. Serve this spaghetti with Pillsbury™ French bread to round out the meal. Use ground beef in place of the sausage. Tip: Tired of pasta sauce staining your plastic storage containers? Mist the inside with cooking spray before filling to create a stain barrier. More cooking spray tips. Substitute 1 carton (32 oz) Progresso™ vegetable broth for the chicken broth. Spaghetti is easily one of the most well-known Italian traditions that kitchens across America have adopted and adapted. 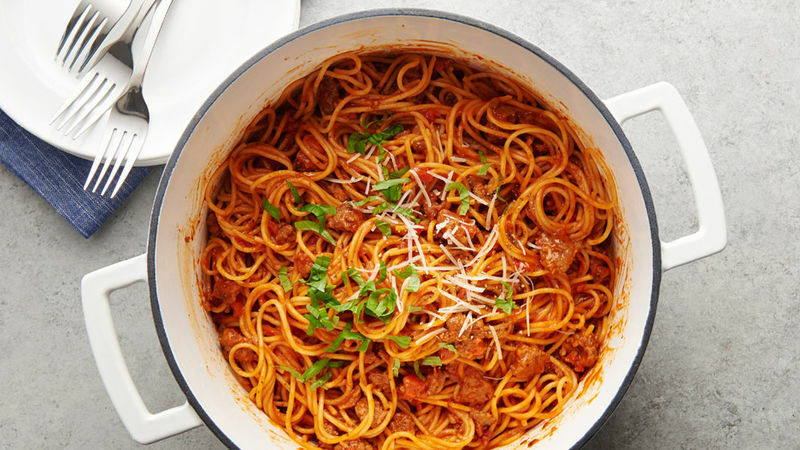 “Spaghetti” is actually the name of the noodle in the dish, but the term has become interchangeable with the recipe name for thin, cylindrical pasta, tomato-based sauce and ground beef or meatballs. There is much debate about where spaghetti originated from, but the widely accepted theory is that it became mainstay in Sicily, Italy. However, Italians have many different interpretations of spaghetti recipes including spaghetti alla puttanesca which includes a red sauce with capers, olives, anchovies and garlic or spaghetti Bolognese which is a meat-based sauce. Spaghetti was introduced to the United States during the early- to mid- 20th century when Italian immigrants began arriving to America. The immigrants brought their own family traditions and secret sauce recipes that had been handed down for generations, and several of those creations can be found in restaurants around the world today. Making pasta at home is totally worth it and if you’re looking to change up the classic recipes, browse through our genius pasta twists that include baked spaghetti, chicken spaghetti and even spaghetti tacos! Check out our how-to to learn how to master a restaurant-worthy recipe that even the Italians would approve of.